In October 1989, the U.S. Naval Oceanographic Office conducted airborne gravity measurements with a Bell Gravity Meter (BGM-3) onboard a Navy P-3 aircraft. These measurements were taken concurrently with a technical evaluation of a newly installed radar altimeter. The survey was flown over the Kelvin Seamount of the New England seamount chain. Navigation control was provided by an Electrically Suspended Gyro and Global Positioning System (GPS) satellite receivers. Eötvös corrections were computed from both the hand-smoothed navigation and the filtered GPS velocity data. Vertical acceleration corrections were computed from the radar altimetry data. The corrections were match filtered to the BGM-3 RC hardware filter prior to applying them to the raw observations. All parameters were sampled at a 1-Hz sample rate. Broadband noise ranging from a few seconds to about 90 seconds was observed in the corrected data and is assumed to be related to aircraft dynamics. The data were low passed to remove this noise. Crosstrack differences using the hand-smoothed navigation had a RMS of 4.6 mGals, while those derived from the filtered GPS data were slightly higher. 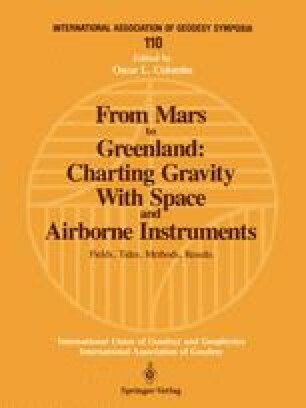 Inversion of this airborne gravity data and the possible detection of ocean standing waves are also discussed.